David W. Lowry, MD, is a neurological surgeon at the Brain + Spine Center who evaluates referred patients to determine whether surgery would be right for them, and also whether other less invasive treatment options might work even better. “It’s important to remember that often, the best option is not to have surgery. When I once asked a wise and experienced professor why it took so long to train a neurosurgeon, he responded only partly in jest, that it took about two years to learn how to do neurosurgery, and then another five to learn when not to. His answer has stuck with me, and I’ve shared it with many patients over the years, “ remarks Dr. Lowry. Dr. Lowry received his BA from Hope College, in Holland, Michigan. While in medical school at Johns Hopkins he worked in the laboratory of Henry Brem, MD, a pioneer in using biodegradable polymer wafers to deliver drugs and other agents directly to the brain while bypassing the blood-brain-barrier. While at the University of Pittsburgh following medical school, Dr. Lowry completed his internship and neurosurgery residency over seven years and obtained his MBA. He then practiced in Grand Rapids for four years before starting the Brain + Spine Center in Holland, Michigan. “I’m proud of the fact that the hospitals for my medical school (Johns Hopkins) and residency (University of Pittsburgh Medical Center) are both in the US News Top 10 Hospitals for Neurology and Neurosurgery out of over 1300 medical centers nationwide that receive difficult cases. Both institutions gave me great training for what I do today,” states Dr. Lowry. Dr. Lowry is a member of the North American Spine Society (NASS), Congress of Neurological Surgeons (CNS), The Johns Hopkins Medical and Surgical Society, Ottawa County Medical Society and the Michigan State Medical Society. He lives in Holland with his wife, Donna and their three sons, William, Sam, and Jonathan . Along with them, he enjoys cycling, kayaking and sailing his Sunfish sailboat on Lake Michigan. Dr Lowry also enjoys medical device development, golf and alpine skiing. Dr. Lowry and his wife are active in the community, volunteering and supporting many organizations. They support their church and two (very early) Sunday’s a month they help out making coffee and cutting bagels. “Why a guy who needs all ten fingers, serves in this way still isn’t clear to me but I enjoy supporting fellowship among people of faith and also supporting the growers of the fair trade coffee we use – and we use lots of it!” jokes Dr. Lowry. 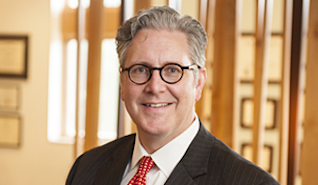 He and his wife are also raving fans of Hope College, (their alma mater), where Dr. Lowry serves on the Board of Trustees, Secretary of the Board, Co-chair of the Investment Committee overseeing the college’s endowment fund, and as chair of the Presidential Search Committee. He is also a member of Holland Hospital’s Medical Executive Committee and Trauma Committee. While collaborating with other providers at Brain + Spine to provide the highest quality of clinical neurosurgery to today’s patients, for tomorrow’s patients he collaborates with others to pursue medical innovation. 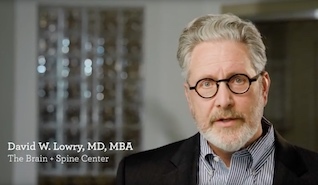 Dr. Lowry has also served as a consultant for venture capital firms such as the Mayfield Fund and New Enterprise Associates (NEA) as well as for some of their portfolio companies at work on neuroscience medical devices such as Northstar Neuroscience and LaunchCyte. Methods and systems employing intracranial electrodes for neurostimulation. Implantable bone plate system and related method for spinal repair. Dr. Lowry has written many professional publications and has been published in the Journal of Neurosurgery, Surgical Neurology, Neurosurgery, New England Journal of Medicine, and Stroke. Transmembrane Sodium and Water Transport at the Department of Biology at Hope College in Holland, Michigan. Advisor: Donald Cronkite, Ph.D.
Neuronal Transplantation at the Department of Neurological Surgery at Johns Hopkins School of Medicine in Baltimore, Maryland. Advisor: Henry Brem, M.D. CNS Drug Delivery at the Department of Neurological Surgery at Johns Hopkins School of Medicine in Baltimore, Maryland. Advisor: Henry Brem, M.D. Chemotherapeutic Synergy for CNS Tumors at the Department of Neurological Surgery at Johns Hopkins School of Medicine in Baltimore, Maryland. Advisor: Henry Brem, M.D.